There's something about being at an office that can bring on a particular type of hunger. Maybe it's the fact that we're staring at screens for hours at a time, and so we mindlessly eat. Maybe it's because we're sitting through yet another budget meeting, and so food becomes entertainment. Maybe it's because more and more offices are offering free snacks, and it's nice to nibble on something as we approach a never-ending onslaught of emails. When considering all of the aspects that go into a typical workday, it's no wonder that our stomachs grumble plenty of times before it's time to leave. But before you join your coworkers to indulge in whatever sugary food is in the break room, keep your cool and try these 12 healthy snack options instead. From a soothing blueberry smoothie and an energy-boosting pistachio macaroon granola bar to oatmeal bites and various dips, these are the types of choices you need to power through whatever your 9-to-5 throws your way. Since snacking on the job is almost impossible to avoid, these picks are sure to make that habit as flavorful and stress-free as possible. And as for your inbox, well, we wish you luck. There are meetings that should've been an email and then there are meetings that—if your nerves had any say in it—should've been canceled. For those days when you dread a certain conversation with colleagues, bring along this soothing smoothie to keep your wits in check. Abbey Rodriguez from The Butter Half combines lavender, blueberries, honey, coconut oil, and a banana into this healthy snack to make for a filling and calming break in your day. Blend it in the morning, and keep it on hand when it counts. Don't Forget: "This recipe is incredible. It is light and fruity, aromatic, gluten-free and vegan (by swapping out the honey for agave)," Rodriguez says. If you've been sitting at your desk for what feels like an eternity, but as it turns out its not even 11 a.m., then these oatmeal bites from The Butter Half will give you the energy and focus you need to get to lunch. They're made with dried figs, almond butter, vanilla extract, oats, and chocolate chips that have been blended together and then chilled to keep their form. Store them in a container to throw in your work bag and you're all set. Don't Forget: "Place in a sealed container and chill in the refrigerator for about 20 to 30 minutes until firm," Rodriguez notes. "Keep for up to one week." Our last installment from The Butter Half is all about versatility. This gluten-free and vegan hummus recipe, which is made with canned chickpeas, tahini, garlic, olive oil, and lemon, can be whipped up in an Instant Pot in as little as a half hour. So, if you make this recipe on a Sunday night, and then pair the dip with vegetables or pretzels, you'll have a healthy snack ready to go for the whole week. Don't Forget: "Use high-quality tahini and olive oil!" Rodriguez says. "These are items to spend a little extra on. And make sure you don't get too heavy-handed with the tahini, or it can ruin the taste." This inventive recipe for granola bars from Jessica Merchant at How Sweet Eats is exactly the type of snack to reach for during those early-afternoon slumps. Aside from its namesake ingredients, these bars are made with brown sugar, shredded coconut, almond flour, and rolled oats that are drizzled with melted chocolate chips and coconut oil. In other words, you'll get the sweetness you crave with the filling quality you need. Don't Forget: "Allow the mixture to cool completely before slicing into bars," Merchant says. "You can drizzle the chocolate on top before or after cutting, or you can also dip them." Seeing as "healthy snack" is in the title of this recipe from How Sweet Eats, it's pretty much a no-brainer that Jessica Merchant has you covered on this front. For this recipe, she combines banana chips, whole almonds, coconut flakes, pepitas, and pecans into an array of spices and sweeteners—think cumin and maple syrup—for a layered combination of flavors that has the added bonus of convenience. Either you eat this on the go, or you stash it in a container for a much-needed desk break. Don't Forget: "Break it apart and portion out into bags," Merchant says. "If desired, you can add dried fruit, like cherries or cranberries, in with the mix." Think about this: You're at work early, and you're getting a lot done. It's not even noon, and you think you can finish most of the day's tasks before 3 p.m. How great would it be to take a well-deserved break with one of these snack squares? Merchant at How Sweet Eats combines fresh strawberries, honey, and chia seeds together to make a jam and then creates a pastry with brown sugar and oats. The jam is spread on to the pastry to make bars, and then everything is covered with cinnamon sugar crumb topping. Don't Forget: "To make the crumb, whisk together the sugar, cinnamon, salt, and melted butter until combined," Merchant says. "Whisk for a good minute or two until the sugar begins to dissolve, and then use a wooden spoon to stir in the flour. The mixture will be crumb-like and dry." It's typical to eat an entire bag of greasy chips as you check your email, barely registering the taste, and then wonder how you ate everything so quickly. Instead of doing that, which tends to come with a bit of regret, opt for these healthy golden beet chips that'll get your attention with their taste and color. Merchant at How Sweet Eats makes the chips with golden beets, garlic powder, and smoked paprika—which is baked and sprinkled with salt—and then she whips together a goat cheese dip for the side. You won't want to miss a single bite. Don't Forget: "Let the chips sit to cool completely," Merchant says. "This is where they will crisp up, and why you don't want to over-oil them!" Nevertheless, if chips are your weakness and you're not giving them up—there are just too many spreadsheets in your life to care—then at least give them a healthy assist with this garden herb avocado dip from Half Baked Harvest. Tieghan Gerard combines the title ingredient with tahini, garlic, lemon, lime, cilantro, and basil, and tops it all with a drizzle of olive oil. It's exactly the type of add-on that'll make a bag of chips that much better. Don't Forget: "It will take you maybe ten minutes start to finish, assuming you happen to have all the ingredients on hand (which I almost always do)," Gerard says. Sometimes healthy snacks grant permission for another need: happy hour. And if you're thinking, "If I eat something healthy now, then I can have cocktails with my coworkers later," then this recipe from Half Baked Harvest is for you. Gerard takes cashews, almonds, hemp seeds, dried goji berries, sesame seeds, and coconut flakes, and forms them into a mixture using honey, cinnamon, tahini, and other spices. It's all baked until golden brown, and then cut into bars. Hello, happy hour. Don't Forget: "They're full of fiber, antioxidants and healthy fats that will keep you full and help you avoid starvation," Gerard notes. If you're feeling nostalgic for those long-ago recess breaks at school, when your biggest worry was the spelling bee and not an all-hands meeting, then return to your childhood innocence with this recipe from Half Baked Harvest. Gerard creates classic fruit roll-ups using various diced fruits—like peaches, mangoes, strawberries, and blackberries, for instance—and mixes them with lemon juice and honey. The mixture is poured on to a baking sheet in one layer, and baked for up to eight hours. Make this happen over a weekend, and you can relive childhood for days to come. Don't Forget: "It is really important to make sure the mix is all in one even layer," Gerard says. "To help with this, I found tapping the pan against the counter a few times to be helpful." What if you’re the type of friendly coworker who likes to share their food with others? In that case, opt to make this recipe from The Minimalist Baker the next time you’re in a giving mood. 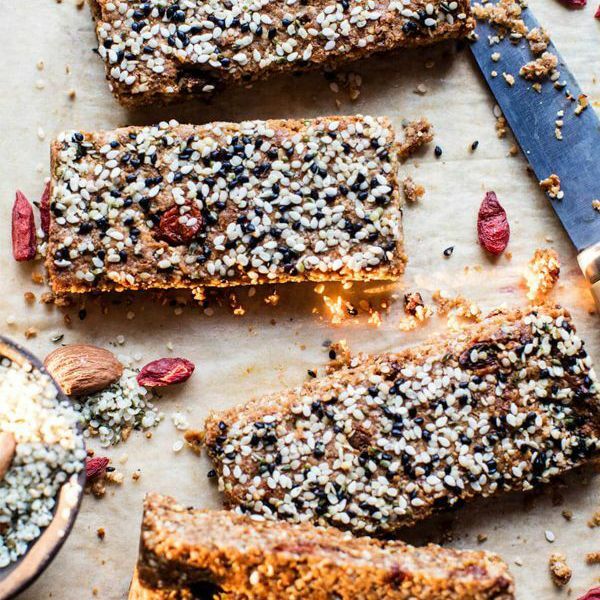 Dana Shultz makes these snack bites by combining the namesake flavors with hemp seeds, protein powder, dates, cinnamon, and sea salt into a mixture. The mixture is then scooped out and cooled so that it firms, taking about a half-hour to complete. These are the types of bites that you can leave out on your desk for everyone to snack on. Don’t Forget: “It's important that your tahini is smooth and pourable, otherwise the bites can turn out too dry,” Shultz notes. Call it a snack, call it a small lunch, call it whatever you need to in order to get through the day: These rainbow wraps from Sarah Tuck at Stuck in the Kitchen should be on your work food rotation if only to appreciate the colors before diving in. Tuck makes these with shredded red cabbage, grated zucchini, sliced avocados, shredded chicken, greens, and seeds, and then add in mayo, hummus, and soy sauce for added flavors. It tastes just as good as it looks, and will make you feel good in the process. Don't Forget: "Sprinkle over a tablespoon of seeds and roll up firmly from the base," Tuck says. "Repeat with remaining wraps before cutting in half to serve." Up Next: Parents, Pack These 11 Healthy Road Trip Snacks for Your Kids to Avoid Meltdowns.